When you’ve completed the CBT you’ll be given a DL196 form. You must produce this before you can take the practical motorcycle test. You need to pass both elements before you can take your practical test. The questions in each multiple choice test vary according to the category of vehicle. A motorcycle theory test contains specific questions that don’t appear in any other test. Before you start the test for real you are given a chance to practice so you can get a feel for how the screen works etc – this is your chance to settle your nerves and relax so make the most of it. You can also practice online at home before you take the test. The test takes 57 minutes and you will be asked 50 questions. You need to get 43 or more correct to pass this element (86% for the mathematicians among you). As each question appears on the screen you will see several answer options – you select one by touching the screen. Note – for some questions you need to select more than 1 answer. If you don’t know the answer to a question or want to come back to it you can flag the question and return to it later. But don’t forget you do only have 57 minutes for the whole test. You can practice for this element of the test by clicking the link to the left. Once you’ve finished the multiple choice element you can have a three minute break before the hazard perception test. Before you go onto this element of the test you will be shown a short video explaining how it works. As with the multiple choice element this part is also done on a computer, this time using a mouse. You’ll be shown a series of video clips each of which contains a developing hazard, which gets more obvious as the clip progresses. Watch carefully though – one of the clips contains 2 hazards. Your job is to identify the hazard(s) and the earlier you do so the higher you score. Click the mouse as soon as you see a hazard developing that could result in you having to take some action, e.g. changing speed or direction. The maximum you can score for each developing hazard is five points. Because this test is trying to judge your awareness you will not be able to review your answers – you won’t get a second chance on the road so you don’t here! To succeed in this part you need to achieve a score of 44 or more out of 75, (that’s 59%). You can also practice this part of the test by clicking to the left. At the end of the hazard perception part of the test you’ll be asked a number of customer survey questions. You don’t have to answer them if you don’t want to and they don’t affect the result of the test. When you have finished the test and have left the examination room you won’t be allowed back in. You will then be given your result. DON’T FORGET – you need to take BOTH parts of your drivers licence with you – If you have an old style paper licence you will also need your passport. No ID – no test! Once you have the theory test under your belt you can go on to take the practical element of the test. The practical part of the motorcycle test has changed slightly – this is due to European legislation since 27 April 2009. It is known as The Second European Driving Licence Directive (2DLD) and was put in place to make for safer riding. It’s not a massive change, but it means you have to do the practical test in two stages or modules. After successfully completing your module 1 test, you will complete a pre–arranged road route, accompanied by your examiner. 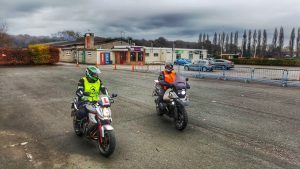 You will then be taken back to the test centre, where the examiner will give you your result – hopefully the good news that you’ve passed and now have a full motorcycle licence!